SAGITA COM - Input Direktur memungkinkan Anda mengontrol beberapa sistem Windows menggunakan keyboard / mouse melekat pada satu komputer. Hal ini dirancang untuk pengguna yang memiliki dua (atau lebih) komputer di samping satu sama lain dan menemukan diri mereka secara teratur beralih dari satu sistem ke sistem yang lain. * Easy to follow installation and usage guides - setup only takes a few minutes. * Tell Input Director how your monitors are positioned simply by dragging them to the correct spot on the monitor grid. 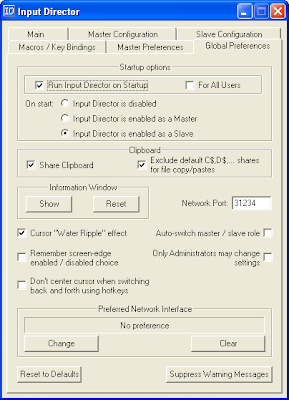 * Shared Clipboard - copy and paste between computers (including files!). * Transitioning control to another computer is a simple as moving your cursor off the screen on one computer for it to jump to the other. * Able to control a computer without needing to login to it first. * Supports Windows fast user switching. * Compatible with Vista User Account Control pop-ups.